Ho Chi Minh City, city in southern Vietnam, located on the Sai Gon River, just northeast of the Mekong River Delta. It is Vietnam’s major port and an important commercial and industrial center. The city has an almost uniformly hot and humid climate, with average high temperatures ranging from 32° C (89° F) in January to 31° F (88° F) in July. A dry season lasts from November to April, and a wet season from May to October. Annual rainfall is 1,860 mm (73 in). 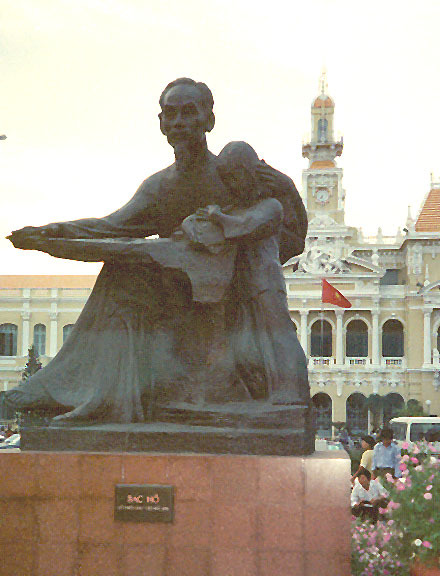 The city is named after the revolutionary leader and North Vietnamese president Ho Chi Minh. The Ho Chi Minh City metropolitan area covers an area of 2,356 sq km (910 sq mi). It is composed of 12 urban wards and 6 rural districts. The rural districts make up more than 90 percent of the total land area and extend from near the Cambodian border in the west to the South China Sea at the mouth of the Sai Gon River in the east. The vast majority of the population, however, lives in the 12 urban wards. The downtown area, in Ward One, is home to most of the city’s government offices, civic buildings, and well-known monuments. The modern Hall of Reunification (formerly the Presidential Palace, completed in 1966) is located here, as is the ornate City Hall (1908), built by the French during the colonial period. 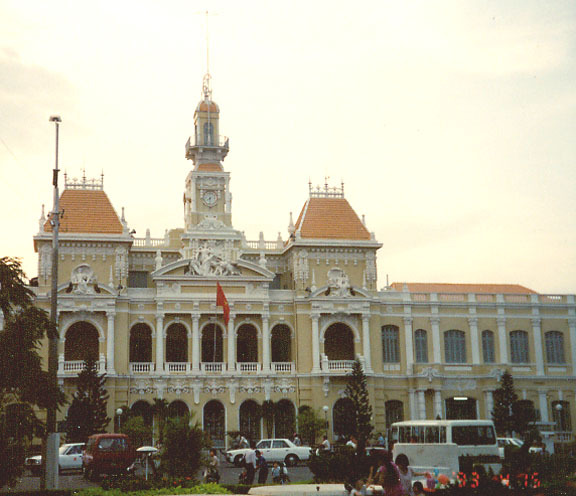 City Hall is now the headquarters of the People’s Committee of Ho Chi Minh City, which governs the city. 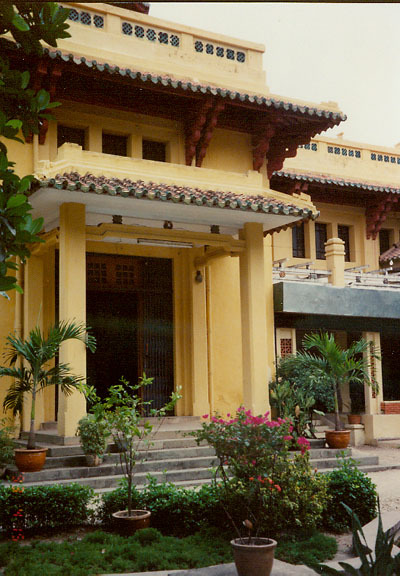 Ben Thanh market, the art museum (formerly the colonial governor’s residence), and the former United States embassy (now the headquarters of the state-run Vietnamese Oil Company) are all located downtown. In the center of the city is Dong Khoi Street, perhaps the most famous road in the country. Known to the French as Rue Catinat and known during the Vietnam War as Tu Do (Freedom) Street, it stretches only five blocks from Notre Dame Cathedral (1880) to the banks of the Sai Gon River. But Dong Khoi forms the vibrant heart of the entertainment quarter, with restaurants, bars, luxury shops, and a number of famous hotels. 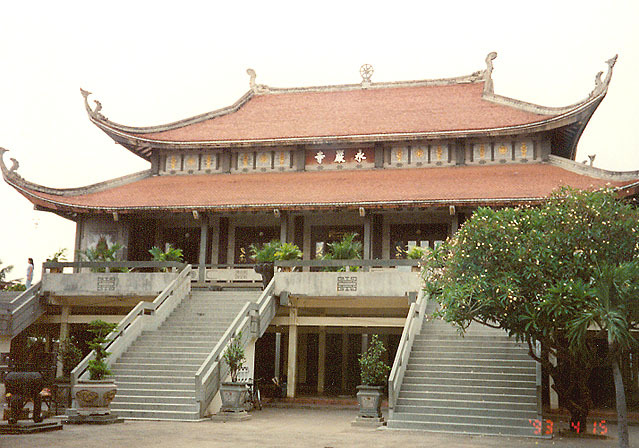 At the intersection of Le Loi and Dong Khoi streets is the Municipal Theater, once the seat of the South Vietnamese legislature. Outside the city center are broad tree-lined boulevards with offices and residences, many of them built in the French colonial style. The suburb Cholon, lying west of downtown, is home to most of the city’s ethnic Chinese population and has the flavor of a typical Chinatown. Narrow streets are lined with shops selling everything from textile goods to tourist items, furniture, and modern appliances. 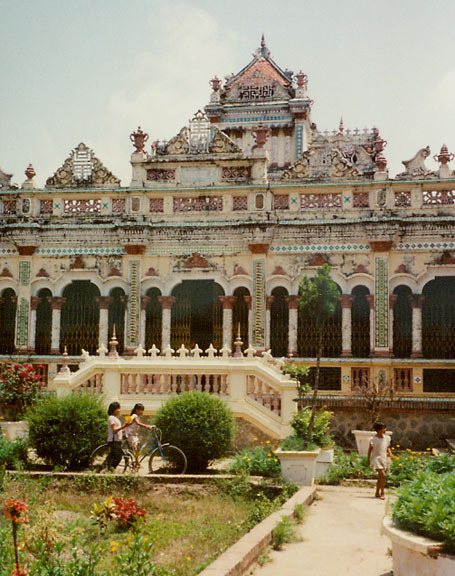 Cholon also has many of the city’s commercial and industrial businesses. 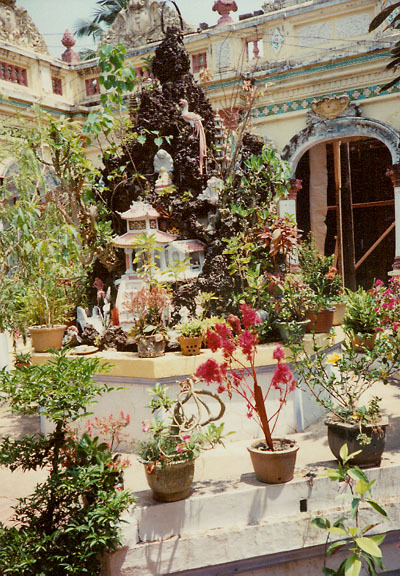 A number of Buddhist pagodas, including Giac Lam Pagoda (1744), as well as mosques, Hindu temples, Catholic churches, and shrines dedicated to patriotic heroes are scattered throughout the city. About 3.6 million people (1996) live in Ho Chi Minh City. The city grew rapidly with the influx of refugees during the Vietnam War (1959-1975), but after the war the government urged more than 1 million people to leave the city for so-called new economic areas in the countryside. Rapid population growth resumed, however, and in the mid-1990s the city was one of the most densely populated in the world, with an average of 20,000 persons per sq km (52,000 per sq mi). The vast majority are ethnic Vietnamese, but there are an estimated 500,000 ethnic Chinese, most of them living in the commercial suburb of Cholon. 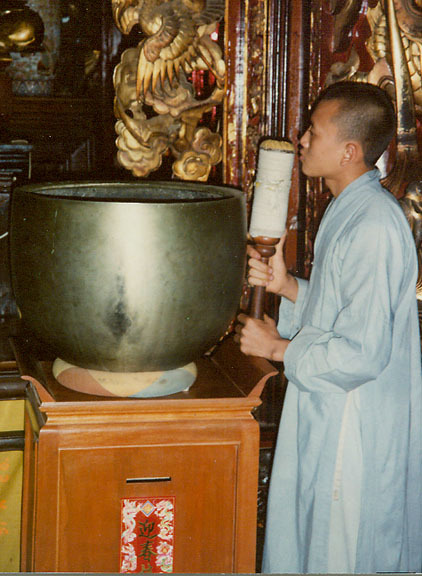 Most Vietnamese who express a religious preference are Buddhist, but several hundred thousand Catholics live in the metropolitan area. Many of the Catholics were refugees who, fearing persecution by the Communists, fled North Vietnam when that state was created in 1954. 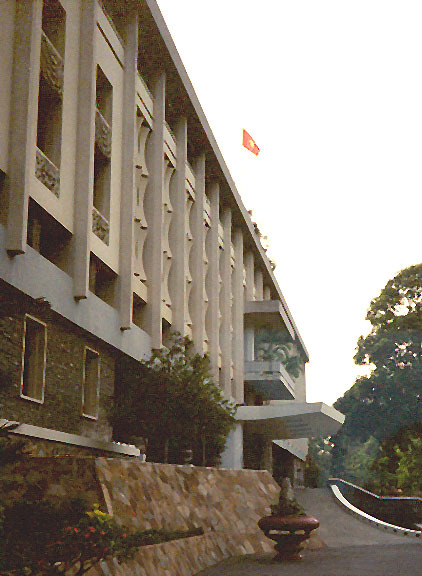 Ho Chi Minh City has two major universities, Ho Chi Minh University (formerly the University of Saigon, founded in 1954) and the privately run Thang Long College (1989). Government agencies and ministries also run several specialized training institutes. 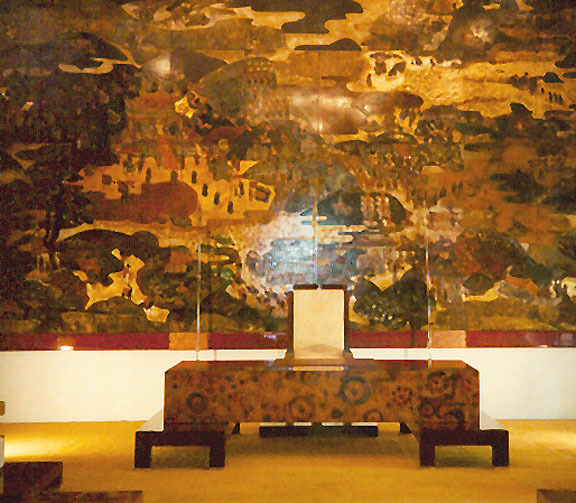 A number of museums are found in the city, including the War Crimes Museum; the Vietnam Revolutionary Museum (1959); the National Art Gallery (1966); the Vietnam History Museum (1958), with exhibits on 3,000 years of human existence in Vietnam; and the Ho Chi Minh Museum (1977), which chronicles the life of Ho Chi Minh. There is also a large zoo. Ho Chi Minh City’s extensive sports facilities include a large tennis center that was formerly a French-run tennis club. Ho Chi Minh City is a major producer of processed foods, such as rice, coffee, and frozen shrimp; glass, plastic, and paper goods; textiles; machinery; chemicals; and building materials. 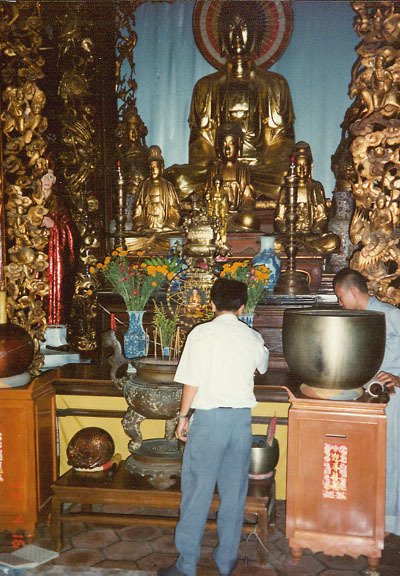 The city has been the most important commercial and industrial center in Vietnam since the beginning of the 20th century, when French colonists and local businesses began to export rice, rubber, and other tropical products. During the Vietnam War, the city benefited economically from a massive U.S. military presence. 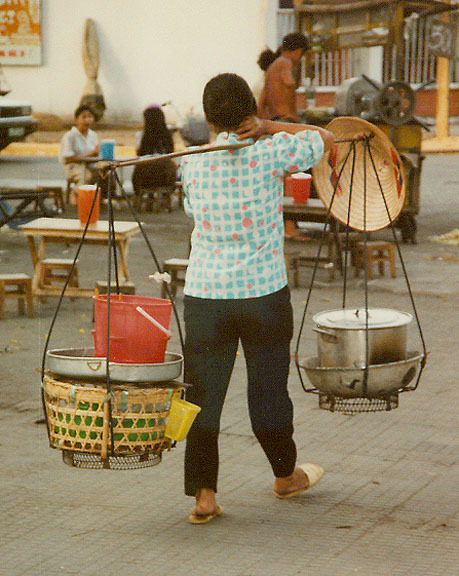 When the Communists took Saigon in 1975, its commerce was largely unaffected because the new regime did not initially interfere with private profits. That policy, however, came to an abrupt end in March 1978, when the central government in Hanoi announced that all private businesses would become state- or collectively owned. The decision sent the national economy into a rapid descent, and thousands of people fled the country. 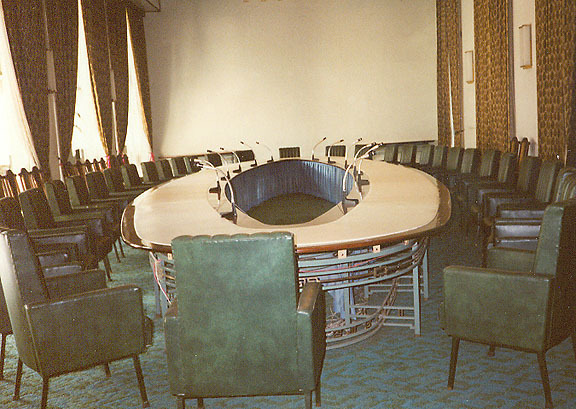 In 1986 the government reversed course and launched a reform program called doi moi (economic renovation), which sought to create a mixed private-public economy. A small but active sector of private businesses was restored throughout the country, and during the next few years Ho Chi Minh City became the driving force in the reviving national economy. Private enterprises, many of them managed jointly with the government or foreign businesses, began to spread throughout the city. By the early 1990s the city produced 30 percent of the country’s manufactured goods, handled 25 percent of its retail trade, and was home to nearly half of its private factories. In the early 1990s private businesses generated 43 percent of Ho Chi Minh City’s industrial output. The city was given an extra growth stimulus when the United States ended its economic embargo against Vietnam in 1994. Like the rest of the country, one of Ho Chi Minh City’s main obstacles to economic growth in the 1990s was its underdeveloped infrastructure. During the colonial era the French built an extensive road and rail network, and during the Vietnam War the United States helped further develop rail, air, and port facilities. But conditions deteriorated after the war’s end in 1975. The large air base at Tan Son Nhut, located northwest of the city, is in need of modernization, and the port facilities on the Sai Gon River are badly overcrowded. Rail links between Hanoi and Ho Chi Minh City have operated since 1976, however, and the main highway running northward along the coast from Ho Chi Minh City was improved in the 1990s. Still, the city in the mid-1990s was well behind other economic competitors in the region. Ho Chi Minh City was founded in the 18th century by Vietnamese refugees migrating southward to escape civil war in the north. 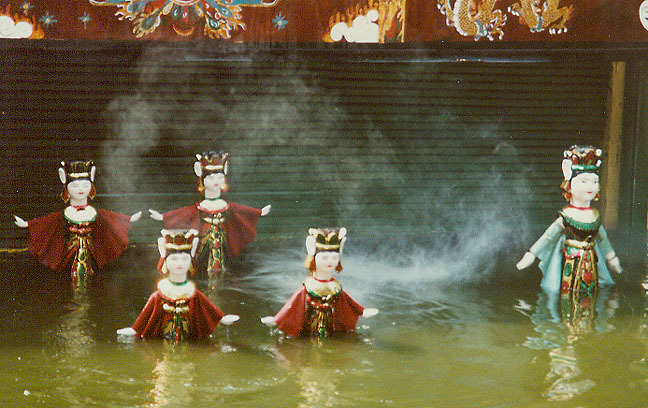 The refugees formed a small settlement on the Ben Nghe (now the Tàu Hú) River, a tributary of the larger Sai Gon River. Soon after, Chinese merchants began to settle in the area and the town gradually became one of the commercial hubs in the region. In the early 19th century the ruling Nguyen dynasty named the town Gia ðinh, and after the French conquered the area in 1859 the city was named Saigon. 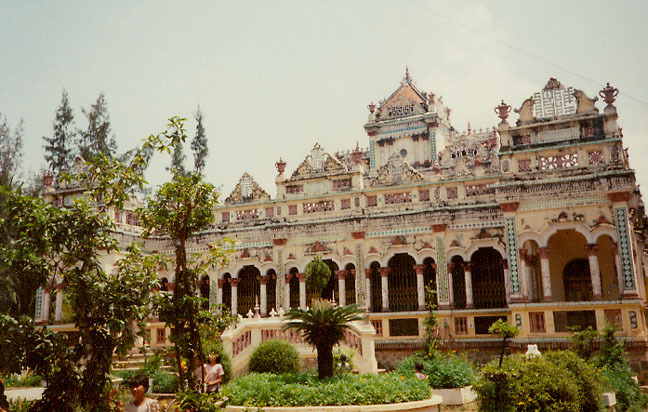 The origins of the name are uncertain, but the Chinese translation of Saigon is "Western Palace." 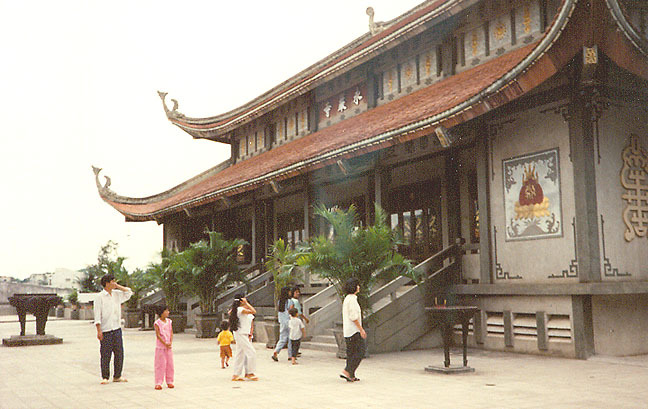 During the French colonial era, Saigon was the capital of the French colony of Cochin China. French rule ended in 1954 after years of fighting between French and Vietnamese forces. Under the terms of the peace settlement, Vietnam was temporarily divided into the Democratic Republic of Vietnam (North Vietnam) and the Republic of Vietnam (South Vietnam); Saigon became the capital of South Vietnam. 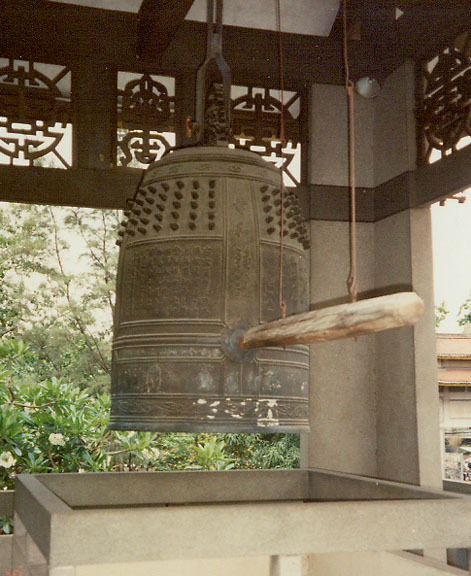 In the 1960s the city was at times the scene of heavy fighting during the Vietnam War. Its population grew rapidly with the introduction of refugees, in addition to the many U.S. troops and officials stationed there. At the end of the war in 1975 the North Vietnamese captured Saigon, and when Vietnam was reunified in 1976, the city’s name was changed to Ho Chi Minh City. Most of its residents, however, still call it Saigon.